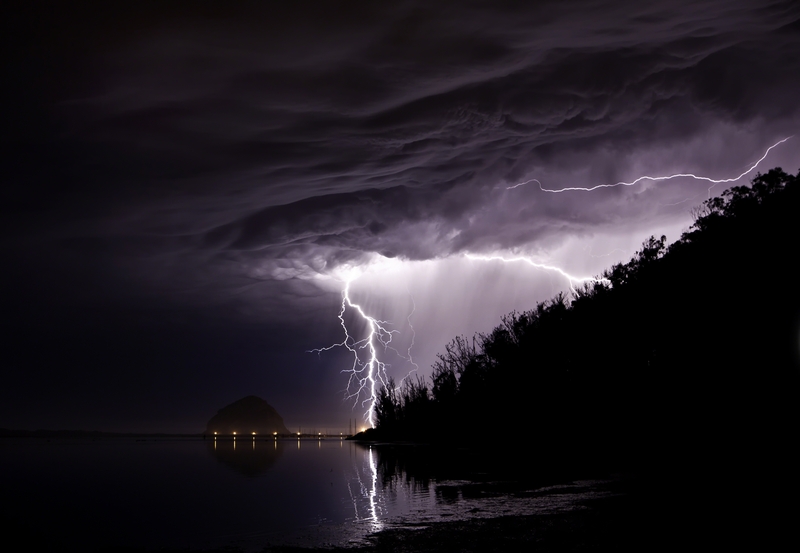 “How many times in Morro Bay do the winter skies open up and streaks of bright white lightning fill the night sky? The answer: not very often. In fact, in the nine years we have lived in Morro Bay I can say this was the first. It was Saturday night on Highway 1 driving home from San Luis Obispo when a bright bolt of lightning pierced the night sky right in front of us. We screamed so loud I think we missed the thunder that usually follows. My foot went straight to the floor in excitement. We made it home in record time, grabbed our gear and headed for the water. During our short trip home we had already discussed the location and had decided the best setup for the location so my wife was assembling the gear as I drove us to location. By the time we arrived at location she had loaded our Canon 5D Mark II with our TS-E 24mm Tilt-Shift lens and attached the Canon intervalometer. By the time I was out of the car she had the legs extended on our Really Right Stuff TVC-23 tripod and mounted the camera on the RRS BH-55 ballhead. Kevin Cole is a local Fine Art photographer based in Morro Bay, California. Wow – I would love to know how you did it, so the shot was taken with f/11 and exposure of 45 second? How about the interval-meter, how does it come into play?? Will this shot be possible using film? I love how the lighting strikes behind the point – giving nice depth. Great shot! Mantice, the use of the intervalometer was to allow me a longer shutter than the 30 seconds the camera allows, and, to set exposure intervals to 1 second to automatically cycle the camera. Thank you so much! So I think the interval did the following, right? 45 second exposure – done – wait 1 second – another 45 second exposure – done – repeat. Is this correct? Such an incredible shot! Thanks again for sharing, Kevin.